Recent death of a Bengali tourist due to cold near Rohtang Pass in Himachal Pradesh, when struck in an unusually heavy snowfall brought to my mind a chilling reminder of that day… or perhaps night when me and my partner could have met the same fate and almost at same place and in similar… or may be tougher conditions. It was by large distance, the toughest night of my life and but for those three kind souls, could have been the last one. 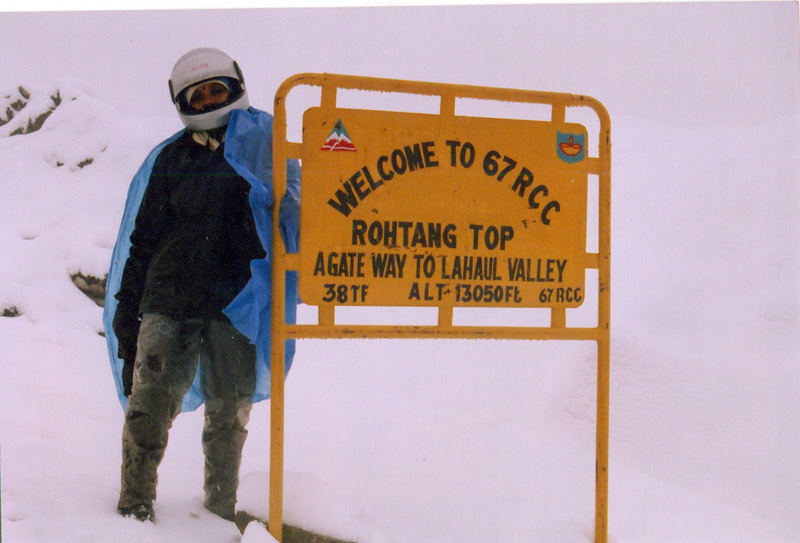 5th July 2005 was intended to be one of the most significant dates in my adventure life, and it indeed proved to be albeit in starkly different context. It also proved, like in this case too, that weather can be too deceptive; it could topsy-turvy all plans and put your entire carefully planned itinerary into waste bin. It could be a cruel joke sometimes. Being a trekker and biker, biking all the way to Ladakh was akin to visit to Mecca, ditto for all adventure bikers. An earlier wish to go around the world on a bicycle been nipped in the bud; dream to biking to Ladakh was well nurtured. In Bhasha, I had an able life partner to support and sustain my adventure escapades. With some support and encouragement, we went ahead. Months were spent in meticulous planning and preparations. I didn’t have a Bullet (that time, now I am a proud owner), that usually bikers on that way normally prefer, but then I had numerous examples of lighter bikes and even scooters going through the treacherous mountain route quite successfully. A brief online search took me to Pardesi Automobiles in Karol Bagh. I got my three year old (Hero Honda) Ambition refurbished enough to withstand the hardship; accumulated all the accessories, including a double sided luggage carrier (of a kind usually used on a bullet, but I got it designed for my bike) and an on-road repair kit. Special care was taken as Bhasha was to ride pillion all the way along and back, since all my earlier attempts to give her some biking lessons had fallen flat. Besides, neither we had any dry run nor I had rode so long (or for that matter even half of it) ever before. But I was more than assured of my homework and some thorough feedback from one of my friends Gagan Sethi who, though younger than me is a veteran of that particular route. But then I was later to have a face-off with the fact that copy-book, Google based homework don’t always work that well. Well, the flag-off was uneventful, so was the ride till Chandigarh, where we had a lunch stopover at Gagan Sethi’s home. First day target was to reach Bilaspur in Himachal Pradesh. But it was quite late when we reached there. I had my first experience of riding in the hills and that too in the dark. It was first day of a unique (for me) riding expedition. We had covered more than three hundred kilometers that day, another first for me. Besides some anxious moments on turns while negotiating with glaring headlights of trucks, we reached Bilaspur safely. But then, riding in the dark was something that we were not prepared well for, something I missed in my homework. Anyway, PWD rest house was our home for that night at Bilaspur. An over-spacious room, nice weather and a caring chowkidar greeted us. After a delicious dinner we were off to bed in no time. Second day was planned to have a lesser travel to keep ourselves fitter for ascend to the Lahaul valley. In a bright morning we left for Manali at a distance of just over 180 kilometres. It was a beautiful route via Mandi, Sundernagar, Pandoh along the Beas river. We had started enjoying the ride by then. We had planned our stay at Youth Hostel at Khakhnal village, just nine kilometers before Manali on the opposite side of the river. Though, now YHAI has given its hostel franchisee to a hotel in Prini village. It was a nice and peaceful place surrounded by apple orchards overlooking river. We had covered the first leg of our journey. Real ride was just about to start. Bike hasn’t given any problem till then, except for snapping of speedometer cable putting my distance calculations into disarray. Once in Manali, weather suddenly started to take bad turn. Although it is normal to have heavy monsoon rains in that part of India during first week of July, but my homework had told me that Lahaul valley was supposedly a cold desert and once we cross over the Rohtang Pass into Lahaul there is hardly any rains. Despite probability of heavy rains, this ‘well-known’ fact kept me encouraging as Rohtang was just about fifty kilometers from Manali. We kept ourselves in good spirits. Rain didn’t wait for next day. As soon as we were back to the hostel after dinner at a nearby restaurant, it started raining. Whole night I could hear the thunder and the fall breaking the silence of the valley. I would be lying if I say that I was not worried. I was keeping my fingers crossed for the next day. It was a gloomy morning with rains everywhere and no visible signs of letting up. But then I was again boosting both of us for only a push till Rohtang in the hope that everything will be in control after that. We were targeting to reach Khoksar, less than 25 kilometres downhill from Rohtang to be safe and on the track. We had full specially designed raingears for us. I was quite confident of them to keeps us dry till we reach Khoksar. I never knew that I was awaiting a huge shock. We had barely crossed Manali and started to ascend when we realized that our specially designed, rain-proof, rough &amp; tough gears were not able to withstand the heavy downpour. We had already started feeling wet inside and windy &amp; cold conditions were sending chill down the spine. Ride from Marhi to Rohtang Jot is a tricky one, with many glaciers on the way. 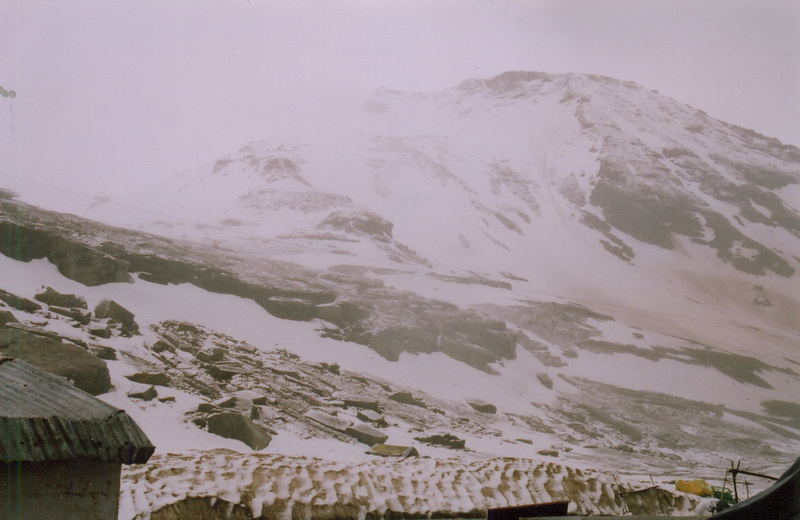 It was 1 in the afternoon by the time we reached Rohtang top- tired and drenched upto the hilt. Still there were many tourists having fun in few remaining short patches of snow. Tourist vehicles were lined up on both sides of the road on the top. I looked out for a food shop where I can park my bike and unpack some of the luggage to ascertain the damage caused by rain. We were lucky to find Lucky Fast food. Weather was still quite overcast, but we were feeling relaxed. Leisurely, we tried to dry some of our clothes, specially socks and shoes. Plateful of hot maggi and tea were just like a new lease of life for both of us. But as if it was not enough for us, it started raining again. It was just about 3 in the afternoon. My mathematical calculations were working overtime. Gateway to Lahaul valley, Khoksar was another 25 kilometres from there. Though reaching Keylong would have been better, but I was ready to bargain for Khoksar, where we could have found a descent place to stay. We were already too late for Keylong. Khoksar was downhill from Rohtang and as per my estimates it should not take more than 45 minutes to reach there from Rohtang Jot. It was also safe to ride until it gets too dark. I thought this option to be wiser than returning to Manali. Going by this calculation, we decided to wait for rain to stop. But, as the destiny would have transpired, rain was unrelenting. In fact it went on becoming heavier and heavier. Sensing weather, tourists started rushing back to Manali. I was perhaps the only biker there. As I sheepishly and foolishly waited for that elusive 45 minutes window, the Rohtang top very quickly became a deserted place. Two hours passed in no time. By 5, I started getting really very worried. But, rain had become so heavy that there was no way I could have ride. Soon, raindrops turned into hails. It was getting freezing cold. Now I could sense where I had put us into. Heavy weather quickly took away all the daylight. All tourists and most of the vendors had already gone down. My immediate worry was what happens if our vendor also decides to pack up. It was our shelter since noon. Now both of us started getting terribly worried. We talked to the hotel guys, they were three of them. To our big relief, they said that they will be staying there for the night. Although spending night there was still the last thought in our minds, but that reality was looming large on us. It appeared to us that actually there was nobody on the Rohtang top besides five of us, or at least I couldn’t trace anybody else. Everybody else had gone down. With last daylight fading away, the rainfall gave way to mild snowfall. Now there was practically no way for us to go, either up or down. 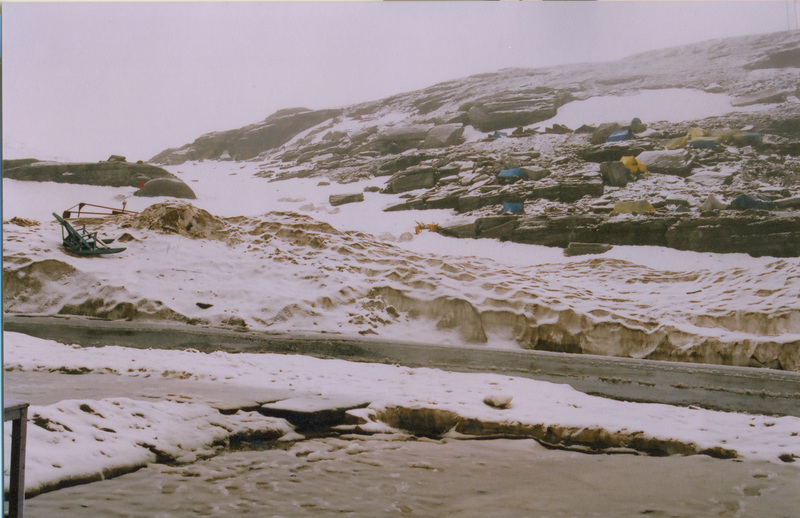 We resigned ourselves to fact that we will have to spend the night on Rohtang pass amidst heavy rains and snowfall in a shelter which we were not sure, would be able to survive the night; in a company of three hotel vendors, about whom we knew nothing. But then we had left ourselves with no other choice, then to have faith in them. Vendors had no hesitation in allowing us to stay there for night despite knowing it very well that there shop had very little space. They were also aware that there was no other option. Hence, for next twelve hours, we were entirely at their mercy. First few hours were spent in talking and knowing more about them and their families. They all were from Mandi in Himachal. This was their summer vocation. In winters they used to move back to their homes. 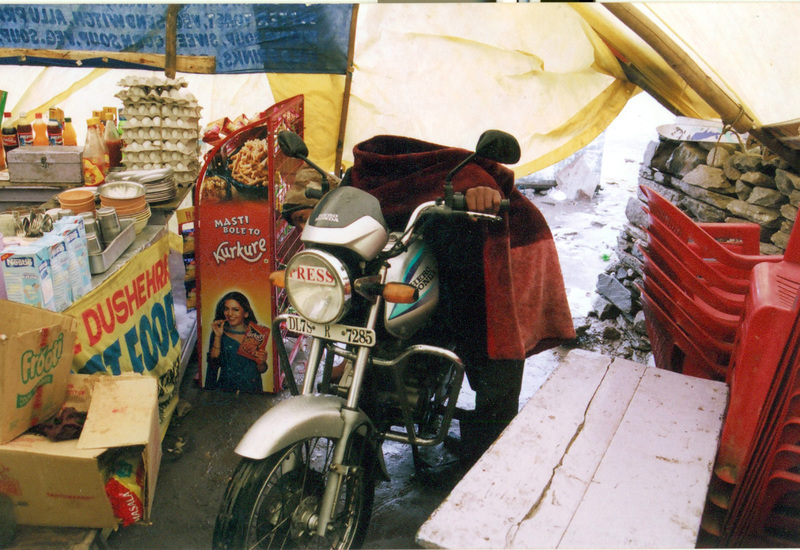 Unlike other vendors, they use to stay at Rohtang almost for whole summer, but for some occasional trips down to Manali to get goods or some emergencies. They all seemed very soft and gentle to us. You will rarely find such guys in our ‘cultured’ metros. Maggi was again the choice for the dinner. Once it was over, nothing else was left to be done except for getting into warmth of a blanket. The shop had a partition. Main part was the kitchen and the shop and on the other side of the partition was the makeshift sleeping place of the vendors. We were not carrying any bedrolls with us as we expected to get night shelters evrywhere. But the three vendors were generous enough to not only give us their blankets and mattresses but also arranged for us to sleep in the inside drier and warmer part of the shelter. For themselves they arranged in the main part of the shop. No words can probably justify our gratitude for them. After so many years, even today just this thought sends a chill down the spine that what would have happened to us were they not there. There was no movement at the pass, except for some occasional vehicle crossing. I parked my bike inside the shop to prevent it from burying under the snow till morning. 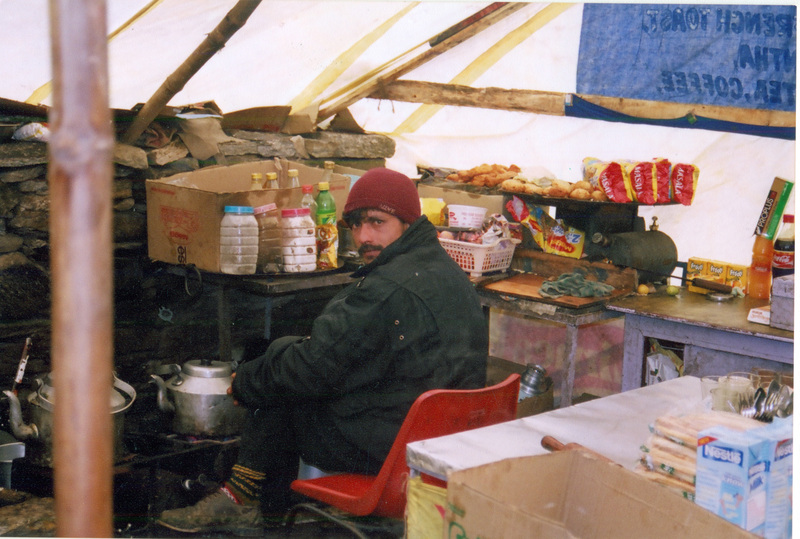 But for our daily needs, there was no other way then to go out in open carrying an umbrella to save from rain and snow. It was snowing whole night and being a high altitude pass, wind was quite sharp and chilling. And actually it was frightening at the most times. Vendors must be accustomed to it, but for us it was indeed a bone-chilling experience. The noise of wind against the plastic sheet being used as roof was terrible. Every now and then we felt that wind will blow away this only shed we have on our heads. And sheer thought of such a happening was unnerving. Quite expectedly we couldn’t sleep whole night. Although terrible headache, high altitude dizziness, fears of unknown, cold and fatigue kept us down and pinned to our beds. It was a very long night. As every night gives way to a new dawn, those terrible hours passed away. Morning was bright. But it was all white. Obviously there was heavy snowfall in the night. Inches of fresh snow was carpeted all over. Still, weather and nightmarish twelve hours failed to dampen our spirits. We decided to move ahead. After some hot tea and breakfast, we were back on our two wheels. Only then we realized that riding a bike on fresh snow was tougher than expected. We somehow managed to reach the Rohtang top, which was another kilometer and half from the shops and the fun area of the pass. Peril started, once we crossed the jot on the way to jigs below. It was so white that usually beautiful curvaceous road with many hairpin bends was nowhere to see. Not many vehicles had passed since night so there were even no tyre marks to follow. Bike was skidding every now and then and one of the slips was very severe. We thought there has to be some end to insanity. We finally decided to turn back. The skids and the slips were so scary that Bhasha decided to walk back to safety instead of riding pillion so that I can handle bike more comfortably. Still we both kept slipping. Once Bhasha even went into snow waist-deep. We somehow managed to reach back to the Lucky fast food. Had a breathe of relief along with tea. With heavy hearts, we came back to Manali. And you know, what? Just before bridge on Beas to cross to the Manali town, bike slipped again. Luckily we escaped any major casualty. Nine kilometers away, Youth Hostel, Khakhnal still had room for us. It was only when we reached to confines of our room and exposed ourselves to happenings around, then we came to that the rainfall last night was one of the most heavy and unusual downpour for the region. We were wise to have turned back from Rohtang as there was not just heavy snowfall on all the major passes till Leh, but the Pagal nallah just across Khoksar was heavily overflowing. Army had stopped all movements on Manali-Leh highway owing to this weather. It means, even if we would have managed to reach Khoksar, there would have been no way ahead for us. Later on, we came to know that Pagal nallah blocked the highway for almost a week. Even Mandi-Manali highway was breached at many places by the suddenly swollen Beas river. It means roads back to Delhi were also closed, although weather had improved a lot. We waited for two days in Manali. Went to places around and even had another trip to Rohtang, this time minus any luggage and met our samaritans of Lucky fast food. As soon as the roads back to Delhi opened, we were off. Our poor journalism jobs couldn’t afford the luxury of waiting endlessly for Pagal nallah to relent. The dream of riding to Leh still lives with us.